The Harmon LED floor lamp features an adjustable gooseneck that allows you to extend the arm and direct light where you need in. Illuminate a living room space efficiently with this adjustable brushed nickel floor lamp. An on/off toggle switch on the column offers easy control. With an adjustable gooseneck arm, and disc shade with glass diffuser. Overall: 56" high. Base is 9" wide x 1 1/2" high. 4 1/2" glass diffuser. Adjustable gooseneck arm extends from 3"-17". Built-in 5 watt LED array. 450 lumens. 3000K color temperature. On-off toggle switch on column. Energy-efficient LED task floor lamp from 360 Lighting. Think this will be perfect for the limited space I'm working with in the master bedroom. Cant wait for it to arrive and set it up. Great look and trusting posted reviews. A friend has one and she says it is a great light. Ordered one and received it this week. Like it so well we are ordering two more. Looks great, and the last lamp I purchased from here didn't work but the return was very easy. I have purchased three task lamps from Lamps Plus--all are very good lamps. Thank you. I already have one and I love it! 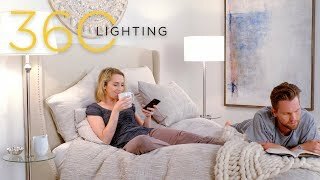 I wanted a reading lamp that was temperature wise cool to read by. I have another led lamp and really like it! Matches my lamps and is a LED lamp for good reading. We rented a house and loved the reading lamp! We asked the owner where she found it and she told us Lamps Plus. This frees up the side tables; table lamps can really take up soo much space! Use to have one similar to this and wanted to try this one. To replace the previous model that looks like this fixture but has been discontinued. Tried to replace busted diffuser . BEST ANSWER: Hi - since the LEDs are built-in (integrated) and non-replaceable, the lamp will need to be replaced. But, they have an approximate life expectancy of 30,000 hours and we include a 1 year warranty. BEST ANSWER: Hi, yes the floor lamp is plug in. Yes, it does plug in the wall. Hope you enjoy it. What are the dimensions when it's positioned in a complete L shape? BEST ANSWER: From the vertical stem, the measurement is 17". Does this light get hot? Would it illuminate piano music over a piano? BEST ANSWER: Hi - this design uses an LED unit which has a very low heat output, generating very little heat at all. The design has an adjustable gooseneck arm, so you could use it direct light to sheet music on a piano stand. I actually have 2 of this light. I have never noticed it getting hot. I use mine for reading. Because of the gooseneck you can put in the position that is best for you. I would think it would be very good for piano music--there is no glare. I love this lamp. It fits anywhere and gives lots of light without glare. Hope it works for you. Sorry for my delay. I just unwrapped it and put it together. I am going to use this light near a reading chair. I used to play the piano and I feel that this would be great lighting for reading music. The light is bright, but pleasing enough without glare. I use it for reading in bed at night. Love it. It does not get hot and yes I believe it would illuminate the music over a piano. The best part is that it is very adjustable. I can rally move it I different positions to where I like it. This light does not get hot. Yes it would illumiminate piano music for your purpose. How thick is the base of the lamp ? BEST ANSWER: The base of this lamp is 1-1/2" But it is not too thick and has great weight to keep things stable. So, I have been watching this reading lamp for months. Finally broke down and bought it for $150. I was easy to assemble, but the first thing I notice is a tag on the lamp saying that the bulbs are not replaceable. Now, THAT would have been good to know in the product details! Now I see that it is $99. Fantastic. 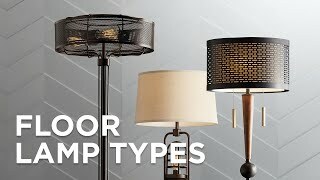 I like the lamp, it was easy to assemble, and I will use it, but buyer beware. Hi Sue L., we appreciate the feedback. We do apologize for any misunderstanding that may have occurred regarding the lighting on this design, which has a built-in (integrated) LED array that is not replaceable. However, LED lighting is made to be an energy-efficient solution that should last a long time. If you have any concerns or questions, please reach out to our customer service team via phone, email, or chat. Thank you. It was perfect for the application we needed. It provides light over a table where someone reads and plays games without taking up much room. Love that it is lightweight enough to move around if needed. Excellent light for doing stitchery work or anything needing good adjustable lighting for a "senior" citizen with a few sight challenges. AND, with the LED light it eliminates the excess heat given off by other types of bulbs. All in all I am 100% satisfied. I need a bright light to read. This one is perfect, and I can adjust the metal shade when I don't need the light focused right on me. 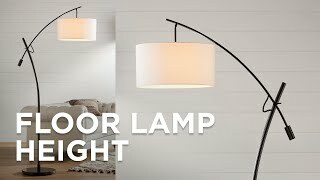 I love this lamp contemporary style; it doesn't take a lot of space and it looks great next to my recliner. It is perfect to read or to do other activities that require a bright light. We were looking for something sleek and simple as a reading lights by our chairs. 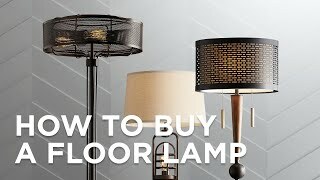 The Task Floor Lamps are beautiful and are exactly what we needed to avoid having to put on our overhead lights in our great room all the time. This is the perfect lamp for a small reading corner in my home. It is inconspicuous and gives off plenty of light to read by. Great purchase. Perfect size for small space over reading chair. It's small so fits about anywhere. It is pretty bright so we shine it on the wall behind us and the reflection gives a soft light. We like it. Modern look. Light level low but good for our bedroom placement. Yellow light color , not white, but expected. Bright light. Lots of flexibility.